I, as always, find myself more and more intrigued every time I go to the movies. It seems like no matter what it is that I’m watching, I can always at least walk away with some social commentary or a charming anecdote to add to my already extensive list of situational stories. After taking a stroll down to Alamo Lakeline, I am pleased to report that, through the magic of Disney, I was able to at least temporarily get over my fear of little children. As if being socially inept and hermit-like wasn’t hard enough, the introduction of children in that most sacred of places (the cinema) is enough to make shivers crawl up and down my spine. Admittedly it was a smaller theater and I was running late, but I found myself flanked to the right by the little kid that wouldn’t shut up and on the left by the girl that wouldn’t sit still. If you’ve ever heard my story of how I almost got kicked off a plane (there were ill-behaved children involved) then you’ll understand why I’m not a fan of confined areas with restless, albeit adorable children. At any rate I was there to enjoy a movie, namely the latest addition from Disney Animation Studios – Big Hero 6. My limited understanding of the movie going in was that it was some obscure Marvel-comic-turned-animated-kids-film, and that’s basically what I left with. The magic in this particular theatre was that as soon as that movie started, those kids shut right up and their eyes were glued to the screen. Comically I think mine were too because this was just a fun little movie. So in the semi-futuristic city of San Fransokyo – a portmanteau (there’s that word again!) of San Francisco and Tokyo, teenage prodigy Hiro Hamada and all around wunderkind likes to build stuff and battle his homemade robots. When his older brother Tadashi has Hiro tag along to his college robotics laboratory, Hiro is inspired to do more with his life than just battle robots and sets his goals on admission to the prestigious program. Despite coming up with a pretty cool nano-bot creation, Hiro’s world is quickly turned upside down when Tadashi and the renowned robotics professor Robert Callaghan are killed in a fire after the demonstrations. 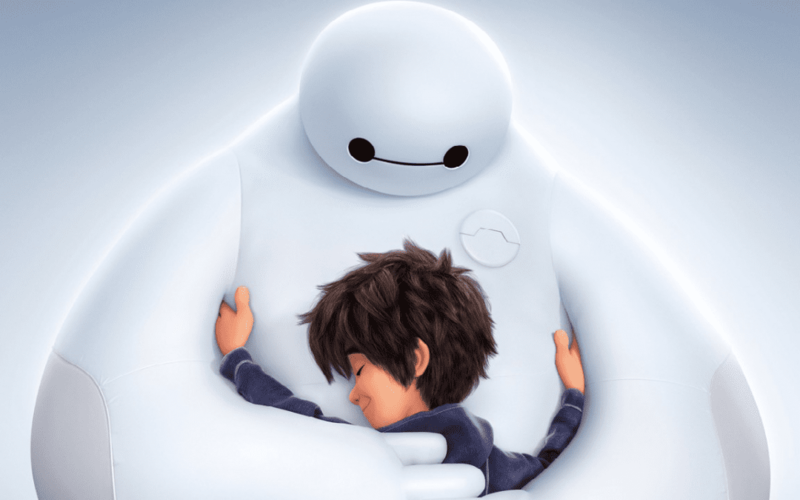 In his grief, Hiro is reunited with a project his brother had been working on that takes the form of a balloon like robot named Baymax, who is basically the Michelin Man if he were a nurse. Long story short, Hiro uses his wunderkind abilities to trick out Baymax and several of his brother’s college friends into superheroes to stop a villainous figure that has seemingly gotten a hold of Hiro’s micro-bot technology (that was presumably destroyed in the fire). The story is one of brotherly love, a robot developing a personality, and a good ol’ fashioned superhero has to stop the bad guy plot. So this is the latest animated feature film from Disney in a kind of resurgence by the once celebrated studio. Who am I kidding, Disney has always been popular, but there was a distinct period in the late 90’s to the late 2000’s where they basically didn’t have much success. First they bought Pixar for an exorbitant amount of money and then Marvel for even more billions of dollars. Then in the last few years or so they’ve had a string of successes starting with Wreck-It Ralph, last year’s hit-sensation Frozen, and now Big Hero 6, which by all accounts is poised to break even more records. Narrowly beating out Interstellar to be the Weekend box-office king with a cool $50 million+ takeaway, BH6 is definitely well worth the hype and what I would perceive to be a great movie for the whole family. I say that because I don’t understand how children’s minds work, but I do know that I thoroughly had fun with this movie. Unlike most recent animated features, there are actually quality elements of storytelling such as character development and a well-balanced blend of action and humor that holds your attention for the entire 100 or so minutes. Basically it’s the The Avengers but for littler kids and animated. Speaking of animation, this movie looked and felt really polished and a lot of the animations were fun to watch. It looked and felt a lot like the other two before-mentioned Disney Animated Studio films as well as a weird hybrid of something like How to Train your Dragon mixed with the Incredibles. I’ was not turned off by the animation like I normally would be in a Dreamworks animated film or god-forbid like I was in The Boxtrolls. It’s pretty cool to see just how much animation has come in a few years and this is a good omen for promising films to come. Overall I thought the supporting characters were decent, though they reminded me too much of a Scooby Doo crew. Their self-made superpowers were kind of fun, though the real star of the show was obviously Baymax the robot. He easily steals the spotlight with his comical, albeit emotionless dialogue and its refreshing to see a new take on a classic story. He’s an easily loveable robot character akin to someone like Wall-E, but with a more bumbling, gentle-giant feel. The story was engaging, the characters actually had depth, and despite it feeling like a weird hodgepodge of all the Disney-owned franchises, Big Hero 6 manages to craft its own unique personality in an otherwise super-hero saturated market. It was refreshing to laugh and cheer along with the film’s target audience – children – but I soon realized that despite being the only person over the age of 5 that wasn’t accompanied by a child, I wasn’t the only adult laughing. This movie brings something for everyone and is a welcome addition from an already successful studio. To conclude my anecdote about my trip to the theater, I was quite taken aback when, at the conclusion of Big Hero 6, the fidgety little girl seated next to me proceeded to share her thoughts and feelings about the film in the most adorable fashion imaginable. She couldn’t have been more than 4, but she was not shy about barraging me, a complete stranger, with her thoughts and questions about the film. She asked me who my favorite superhero of the 6 was (I said the stoner-dinosaur that could ‘breath’ fire) and that her’s was the strong independent Tron-girl character. (Basically she roller-skates around using the Tron light-bike technology and throws the light-disks) So instead of my normal Bottom Line feature, I will try and remember the exact words she used to describe the film and let that be my summary. (From the anonymous 4 year old girl): “I liked it when, ummm when, the balloon robot, he got stuck in the window, and he…he had to umm…let the air out, and…it…it sounded like he was farting *unintelligible giggle* he was so funny because, when Hiro was trying to make…the umm.. armor for Baymax, he couldn’t get him to wear it, because umm…Baymax was too fat…like a balloon *more unintelligible giggles* and umm HewaslikeaballoonandIlikeballoonsalotandIreallywishthatIcouldhavearobotofmyownjustlike-BaymaxandwhenIgrowupIwanttobuildrobotslikeHiroandsavetheworldandfighttheummvillain *pauses to take a breath* Who was your favorite? I really liked umm…the girl with the bike skates because she was really fast and could skate up walls and had really pretty hair and she was super funny and pretty and …. I know Disney owns Marvel, but I found that with the Marvel movies they don’t state its a Disney owned production till the last line of the credits. For instance the Avengers and all those movies they all say Marvel Marvel Marvel everywhere heck even Stan Lee himself makes appearances in them, but then at end of the credits before the special end scenes they say Disney made production. I mean I think Disney should show a little more ownership of their movies. However, they are one of the leading movie production companies in the whole world so I can kind of see where they may not want to be rubbing it in too much. What do you think?????? It’s funny you bring that up, I was actually having this conversation with a coworker the other day. Big Hero 6 was an interesting crossover for Disney because (to my knowledge) the characters themselves are based on lesser-known Marvel characters, and in tribute I believe BH6 even has the iconic Stan Lee cameo (I think he’s the father of the stoner dude and is shown in a family portrait).